Monument Valley is a one of a kind game, a jewel among an empire of clones and rip offs. A brief game, but an experience that will make you feel peaceful, and connected with a surreal world that uses a visual design inspired in M.C. Escher to make a wonderful and enjoyable artsy puzzles. You play the role of The Princess, which is on a quest for forgiveness. As I said in the introduction, these game is about art, and about letting us know that fresh ideas for gaming will never end. The game uses visual illusions and perspective to form new paths to your goal. Look at this trailer to understand how its all done, because if I tried to explain I will just ruin this article. Also the colors, I want to eat those colors. Puzzles are not extraordinarily hard, but that makes it even better, since the focus of the game is on making the illusions and how the visual perspective changes, enjoyable. The most I spent thinking on how to solve a puzzle was probably in the last 2 stages, but I never had to quit and come back out of frustration. They developers really thought about the balance of the game, and how to make it flow naturally without being frustrating. Its hard for me to say "I didn't care about the story" in a game, in fact, and not many games have made me say that, probably Roguelikes are the only ones. 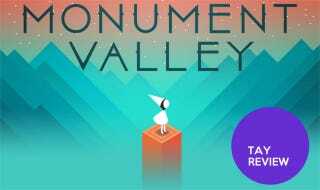 But Monument Valley is not a story focused game, as I said before, its about art and enjoying the visuals, I have to say there was a twist at the end that I wasn't expecting, but nothing that memorable. The game has a steep price for some, but for those who enjoy a good gaming experience even if its brief, the price is just right. I feel the amount of planning, coding, art sketching and implementing this game had was humongous, so $3.99 seems just right to me.